Welcome to your one-stop wheel shop. Welcome to your one-stop wheel shop. There is hardly a service we cannot provide to make your wheels truer, stronger, lighter, and better looking. We have refined these skills since 1973. 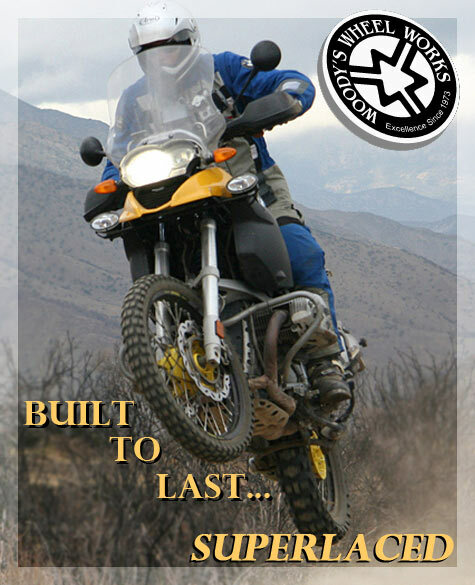 Our commitment to EXCELLENCE covers not just the products we design, build and/or repair, but also listening to your needs based on your riding style and where want to you ride. Thus, you can begin your journey with confidence and peace of mind, trusting your wheels will take you wherever you want to go. Our ability to straighten and retrue the 'un-repairable' X-lace GS wheels is legendary. We can also transform your GS's off-road handling with several 21'' front wheel options from OEM 21'' tubeless X-lace to our performance-oriented Superlaced Superlite billet wheels. Team MAX BMW earned 10 podium finishes on the same wheels, never touched 'em, they're still straight and true. Superlaced... "BUILT to Last!"